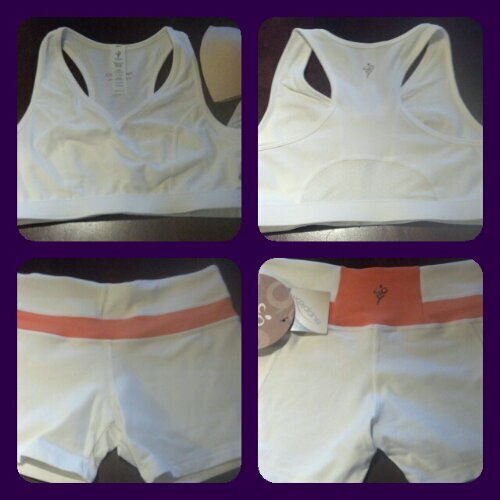 I recently had the opportunity to review the Pisces Yoga Sports Bra and Libra Yoga Shorts both in Optic White from Cozy Orange. Wow! What can I say? From the moment I saw the packaging, I was in love. All of the product packaging is made from recyclable or re-usable material and the hang tag, which is printed on 100% recycled paper, doubles as a drink coaster! Awesome, right? How can you go wrong with Eco friendly yoga clothes? As soon as I took them out of the bag, I fell in LOVE again. They were super soft (made with Supplex ®) and the bra came with removable padded inserts, which I personally love (for reasons we shall not name). I was a little leery about the sizing, as sports bras usually run small on me. I normally wear a 36 B cup bra, but opted for the small (34 on the size chart) after I measured myself at a 33 with my husband’s tape measure (classy, I know, but when you don’t even own an iron, you can’t be expected to own a measuring tape) and it fit well. I actually could’ve gotten away with an XS which would’ve given me a more secure fit, but for working out it was just fine! I wasted no time and hopped on the treadmill immediately after putting the shorts and bra on and busted out (no pun intended) a quick 6 miles. It was great! I sweat like a hog and the Pisces Yoga bra was perfect. It did not bunch, ride, or slip. The fabric is totally breathable, sweat wicking, and did I mention, soft? 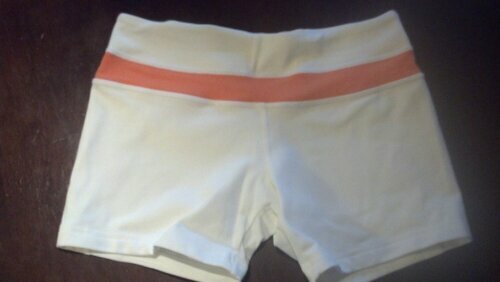 The 4 inch inseam on the Libra Yoga shorts is a little shorter than what I usually wear on a run, but these were great! They did not ride up at all, and offered just enough compression. The fabric of the shorts, same as the bra, was totally breathable, sweat wicking, and completely comfortable! Again, I was leery about the size. With the tape measure, my hips are a 34 and my waist a 27, not quite a category on the size chart! I went with an XS, and it worked! Not that I needed it on the treadmill, but there is a hidden front interior pocket that is the perfect size for a key, photo ID/credit card (trust me, I tried it), a few bucks, or, my favorite running accessory, chapstick! After my run, I threw them in the washer, on a normal cycle, cold water and dryer on medium heat.The Cozy Orange website claims they are pre-shrunk, but I had to test that theory! The bra was a little big anyway, so if it would’ve shrunk, which it didn’t, I would’ve been fine with that! Came out as white as they went it, too! Laundry test complete, and passed with flying colors! One more workout and I knew I was hooked on Cozy Orange Yoga Apparel. I took the Pisces Yoga Sports Bra on a 12 mile run. Like I said before, totally breathable fabric, super soft, and supportive. The only drawback was a little chafing this time, but I think it’s because the bra was just a little too big for me. I should’ve trusted my instinct and went with the XS, but I have a history of sports bras being too small, and did not want that to happen! A little Body Glide, would probably do the trick! Bottom line, this yoga clothing is the bomb! I would definitely recommend the Pisces Yoga Sports Bra and Libra Yoga Shorts to anyone (and everyone) looking for comfortable, breathable, supportive,functional, fashionable, and affordable yoga (running, workout, etc) clothes! They gets five stars in the comfort, style, and performance categories, and a big thumbs up for sure! 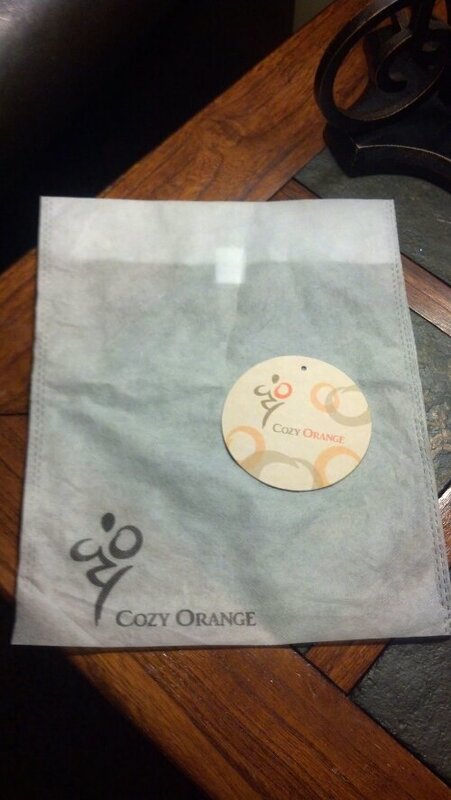 If you love yoga clothing, Cozy Orange is for you, check them out!